Hugo Maximillian Metcalfe and Alex Smith write. I write to you with curiosity, concern and questions about an issue I have recently happened upon. Whilst researching with colleagues for a presentation on young people’s mental health conversations on social media, I stumbled across some of the communities of secret hashtags on Instagram. As most will know, the now ubiquitous ‘hashtag’ is very much a part of the daily conversation, particularly amongst young people aged 13–17. As I explored these hashtags, clicking link to link, image to image, I soon found myself transported deeper and deeper into a hidden-in-plain-sight community of young people sharing experiences of a range of mental health issues. #Ana, #Sue, #Deb, #Cat, #Mysecretfamily and #Annie, are just a few of the hidden conversation keys I came across. If you are unfamiliar with these hashtags, they translate as Anorexia, Suicide, Depression, Self-harm, Self-injury, Anxiety, and Mental Illness, and were accompanied by visceral images of self-injury, extreme weight loss and morbid image content. They seem to serve as keys for people to seek out and unlock these hidden communities and share their experiences with others. Why are they here? What do they represent? How did I find them? These were some of the questions I asked myself as I stumbled through images that even now I can bring to mind. I am aware that these communities have been explored to some degree before. A 2016 paper by Megan Moreno and colleagues considered the use of these and other ‘secret’ hashtags and their role in conversations about mental health. They suggested that these terms appeared as a direct response to attempts to moderate or remove mental health or self-harm related content over fears that it might negatively affect those who view it. It is true that Instagram itself has taken steps to block certain hashtags and continuously monitors and updates its ‘banned terms’ lists. Indeed, I am conscious that the terms listed above are by now all out of date. Yet it seems clear that these attempts to moderate and police are ineffective. Some readers may remember the pro-anorexia movement that came to light in 2012 with terms such as #proana and #thinspiration. Instagram banned 17 search terms it deemed as promoting anorexia, and users searching those terms were met with a blank screen. However, this simply led to the emergence of new communities built up around approximately 250 lexical variants, including #thinspoooo and #thyghgapp (see tinyurl.com/thyghgapp), designed to circumvent the ban. As I read these and other studies and as I reflected on this apparent need for young people to share and discuss ‘mental health difficulties’ in forums like this, I was left wondering what my role and the role of psychology was in this? Was I simply to become another moderator, policing and shutting down conversations deemed too ‘dangerous’ or ‘risky’? Should I be participating in the conversations themselves, offer support, advice and attempt to combat some of the misinformation that appears rife in the comments boxes? I was struck, however, that to do that I would need to start speaking the language of ‘young people’ and finding ways to join them where they live their digital lives. My questions to readers then are: How do we do this? How to we step outside of the current narrative and evolve in these ever-changing times? If young people are reluctant to step out of the web and come to us, how can we bring support to them? They clearly want to talk, so how do we listen? Research in psychology is constantly looking at ways to improve our understanding of mental health, and one area that I believe needs addressing is the problematic use of social media sites in adolescents. Social media has been around since the early 2000s, meaning millennials have had social media throughout their lives, but how detrimental is this to their mental health? Have we fuelled the negative self-esteem, social anxiety and lack of social identity through the ‘clicks’ and ‘swipes’ of a screen, at one of the most crucial times of a person’s life, essentially telling them they are not ‘good enough’ in society? The irony that it is named ‘social’ media, yet it could make a person feel very alienated from others. Many mental health problems have been linked to social media, including depression, sleep disturbance and eating concerns. How often do you see people glued to their phones, scrolling, swiping, clicking? But what is it about these social media sites that is so appealing, especially to the younger generation? Should this be classed as an addiction, now that links have been made to how detrimental their use can be? A ’least restrictive’ approach on some acute adolescent mental health wards is to allow the use of mobile phones whilst supplying the ward with wi-fi, but surely allowing this is not beneficial. Young people can go to bed at night and stay on their phones until early hours of the morning, reversing their sleeping pattern and spending hours on social media without any boundaries. From their beds they have an endless amount of harmful content at their fingertips. 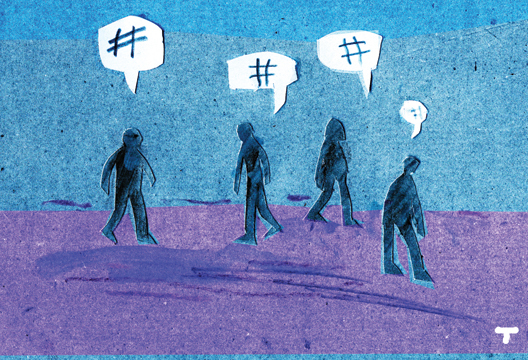 Hashtags are seen as a fun way of linking specific themes or content to others around the world, however when that hashtag is #selfharm or #anorexia, this can become problematic. There are no monitors on these social media sites, just a link that appears if you do research hashtags such as these that will advise you to seek help. The pictures that come up are endless displays of self-harm or anorexia, and could be suggested as promoting mental health problems. A recent trend was #bluewhale, where teenagers were pressured into engaging in self-harming behaviours and after 50 days to end their life, which resulted in the deaths of many teenager worldwide (Upadhyaya, 2017). These are extreme ways that social media can influence young people; however, it was through improper steps and failings of being monitored that this was the end result. So who is responsible? Maybe we all are. Is it up to the mental health practitioners to help adolescents understand and educate them on the implications of the use of social media? Could we combine online behaviours of young people into assessments? Maybe we need to encourage parents to know more about what their child is doing online and to understand the dangers of social media sites (Costello & Ramo, 2017). Going forward, I feel that more research needs to be done in this area as it is occurring more often, along with more measures put in place to stop these issues before they become even more damaging. This short letter only covers a few issues of social media use in adolescents, however more and more we are finding the negative impact it has, so maybe it is something to be addressed in the near future. Costello, C. & Ramo, D. (2017). Social media and substance use: What should we be recommending to teens and their parents? Journal of Adolescent Health, 60(1), 629–630. Why do we ‘like’ social media?